Swoon worthy clothing is definitely more a matter of taste and style than a matter of money. But even still, who wouldn’t want to have the option to splurge on a beautiful designer piece from time to time? Most of us can’t afford to buy every pricey item we like at the drop of a hat, but there is a solution. You CAN get gorgeous designer items significantly discounted prices if you know when and where to shop. We’ve put together this all inclusive guide to help show you the ropes on how to reach affordable designer clothing bliss. Do you have a few favorite designers? Yes? Good. Start with those brands. Bonus points if you are familiar with their sizing. For instance, I love Citizens of Humanity jeans. They fit my body type like a glove and I don’t usually need to try them on – I’m almost always the same size and their stuff just fits me right. This is so not the case with every brand, but with brands I know, I can scoop up a deal when I see it and not stress about whether it will fit. Of course you can always do a return, but why not try to avoid the hassle if possible? 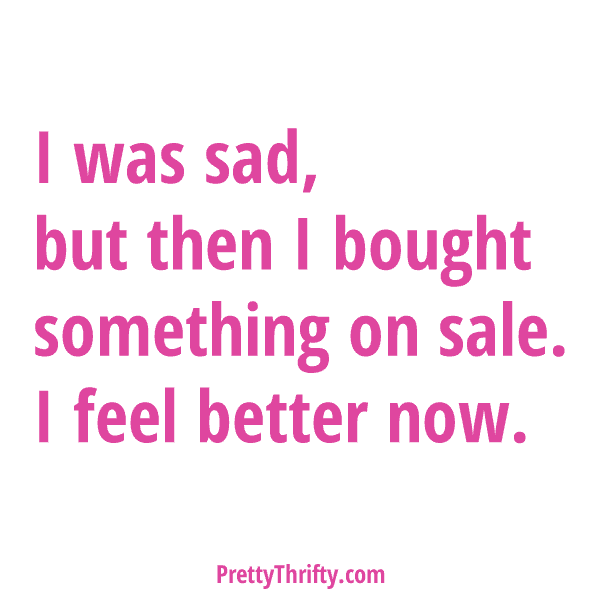 Thankfully, handbags, accessories and most shoes (hooray!) are an exception to this since sizing inconsistencies aren’t typically as much of an issue. Our advice: If there’s a brand you haven’t tried yet, but would like to, take advantage of the opportunity to try on some of their stuff next time you’re in a department store. Even if it’s not on sale, get familiar with where you fit on their size chart so that you can be ready to pounce on deals when you find them down the road. Someone else may snag that gorgeous sweater you find online while you’re debating on which size to delete from your virtual shopping cart. Do your research when you have the opportunity! If you’re going to splurge, I recommend doing it on something you’re going to love for a long time. Something timeless, that won’t go out of style quickly. Think classic boots, heels, handbags, or even a trench coat. When I splurge on something classic, I never regret it. I get so much use out of it and I feel more like I invested in something special for myself. When I’ve caved into the temptation to get that oh-so-trendy, yet cool designer item, I’ve almost always regretted it later and found myself trying to determine the opportune time to ditch it on eBay while I can still get some money for it. This is the biggest question of all. Where do I go to shop? Well, here is a breakdown of the BEST places to find designer clothing for less. These are the ‘sale racks’ of the bigger department stores. You can find tons of significant discounts by shopping at these stores before you hit up their bigger, more expensive parent store. And yes, these guys have their own sales too – making items even less expensive. RueLaLa – RueLaLa is one of my go-to shopping sites. They have special designer brand boutiques that open each day at 9am with significantly discounted designer products. Once they sell out they’re gone (though you can sign up for a waiting list in case there are returns). You can always check out their weekly schedule and even get text updates when certain sales open up! Neiman Marcus Dashes – Their Mid Day Dash (certain days from 11:30am until 1:29pm CST) and Evening Dash (certain days at 4pm until 9pm CST) sales will feature select designer items at huge discounts (up to 75% off) but with limited quantities. Visit their site and sign up for an account, and they’ll always send out an email a few hours ahead of time. Be ready to click on the email at the time the sale is said to start to ensure you’ll have first pick. The sales close a couple hours after they open. Bloomingdales bQuick Sales – These Bloomingdales flash sales feature certain designer pieces (that were regular price the day before) with highly discounted prices. Each piece will almost always sell out. NM Last Call Dashes – A NM Last Call Dash is the sale on the sale on the sale. Obviously, you don’t want to miss it. The items in these sales are up to 80% off the regular Neiman Marcus prices. Create an account and they’ll notify you when every sale starts. .
Frugal Fashion Finds – Lastly, check out the newest section of our site: Frugal Fashion Finds. We are so excited to launch this new feature! We’ll be posting fabulous finds that we come across throughout the week. Clothing, accessories, beauty products, you name it. When we see something particularly adorable at an unbelievable price, we will share it with you so you don’t miss out. These items will not be in stock for long, so be sure to act fast if you see something you like! ThredUp – Get a free $20 credit for a limited time! ($10 off your first purchase and $10 off your second purchase). If you are always wanting a specific item right this minute, chances are you will never be finding your items on sale. This is where the ‘when’ comes in. If you are willing to ‘let the deals come to you’ (aka, be patient), you will save SO much more money! Think of it as ‘keeping tabs’ on the discount designer fashion scene. I do check my Shop It To Me email every day. A quick scan takes about 20 seconds. I also do check the RueLaLa schedule each week (that link is included in every email they send you). It also takes just 20 seconds. I check each flash sale because you never know when something you’ve been eyeing will pop up. I also pounce on sales at the ‘rack’ department stores right when they start. When you have first pick, you’re able to get a huge discount off of the retail price, while still having a great product assortment and more sizes in stock. All in all, patience = money saved. Waiting for the right moment and then jumping on your chance when it comes can have huge rewards. But, if patience isn’t your thing, you can always check out our list of places that sell cute, inexpensive clothes. The fashions at these stores are already priced super, super low, so you won’t have to even wait for a sale. eBay – eBay is an interesting place. Some items get auctioned off at wayyy-over-retail prices while others can be snagged for a stellar deal. Unless you’re shopping for coveted designer handbags or other well known and rare collectibles, your chances of finding clothing you love for less are phenomenal. If there’s a particular item you’re hoping to find, set up an alert and eBay will email you when they find matching listings. If it’s a certain brand you love, do a simple search and you’ll be surprised at how many items you can score for less than retail. *Note: add ‘NWT’ to your search to pull up a list of only items that are brand new with tags attached. – It’s shocking to me how many times I’ve found what I’m looking for on Amazon. Who would have thought? I’ll have checked all the department stores in the country and haven’t been able to find a certain item. I almost always nearly forget to check Amazon. Once I do, it’s insane how often I find it there. And very often for retail or below. Don’t ever forget that money isn’t everything. You can make a smaller budget go a long way by using our tips above. Money also cannot take the place of good taste or an actual sense of style. Stay tuned for our next post featuring beauty,fashion and shopping tips on how to style your outfit to make it look more expensive – whether you paid a lot for it or not. This is very helpful information. Can you send me an invite to shop it to me please? Thank you! I have found name brand clothing at our local thrift store and our Goodwill. We have 7 grandkids and I’ve clothed them all by buying at these stores. I’m not sure as they get older they will wear them if they know where I got them. As long as I don’t tell it should be good ! Frugal Fashion Finds is going to be an awesome section for your site. Thanks for starting it up. Great info! Thanks so much! Shop it to me! This is great info!!! Thanks for sharing! I think patience is so important when it comes to deals! You seriously just have to let them come to you! Love this! I will be on the lookout for these stores soon! One of my faves is NM Last Call, although it can be tough finding the right size. Thanks for the thrifty tips! This is amazing!! I’ve been looking for great deals and this wraps up my research hahaha. Thanks a bunch!! Hi, can I please have an invite to shop it to me? Thread Up might be worth checking out to buy, but I can’t say it’s worth the time or effort trying to sell anything. Great tips!! I’ve always wanted to know when and where to buy all these great deals now I know. I’ve always seems to struggle through the thrift stores looking for “that look” and usually finding a knock off look that I could pull off. Thank you! I know this is an older post, but these are great ideas–thanks! Brilliant idea about getting clear about the different designer/brand’s sizing. I am always worried about ordering things when I find them on sale online because I can’t try them on. If I better understood what sizing works best for me it could save me money, and even better time! I hate returning things so instead they just sit in my closet. This is really helpful information! Thanks for sharing. I love finding good deals. Thanks for the great information that you have shared.I love shopping online for deals.I like Nordstrom and sometimes Just Fab. Shop it to me please! These are fantastic tips! I know some people who only shop the rack stores. Shop It To Me, Please!